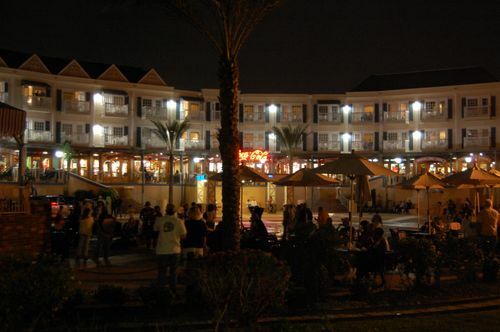 This enchanting vintage looking hotel is located at the opposite end of the board walk from Landry's (On the site of the old Jimmy Walker's Edgewater Restaurant). It is on a brick plaza that features randomly activated water fountains that invite the child in all of us to play. There is also an aquarium there - although repairs have only begun to restore it from the storm damage. Many street performers treat the crowds - a juggler was throwing torches about when we were there. Also on this plaza is an open-air stage.